One Piece creator Eiichiro Oda is a huge fan of Akira Toriyama, best known for creating Dragon Ball and designing Dragon Quest's characters. 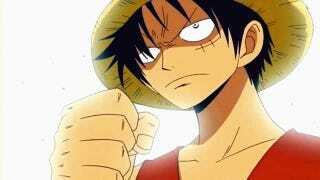 Oda really digs Toriyama's work, but was the One Piece character Luffy inspired by Dragon Ball? A Chinese net user uploaded a panel from what's supposedly an old Dragon Ball manga. In it, you can see the back of a straw hat (kinda like Luffy's) and a skinny character in a tank top (kinda like Luffy). This seems to be the only place that this character pops up. Here's the catch: the original Dragon Ball, where this was apparently discovered, ran until 1995. One Piece didn't start until 1997. So did this panel influence Oda? Not sure. Maybe. Or maybe it's just a kwinky-dink. Or perhaps it was unintentional. I do know that Oda and Toriyama worked together on a manga called Cross Epoch, which featured both One Piece and Dragon Ball characters. The above panel does not seem to be from that special collaboration.